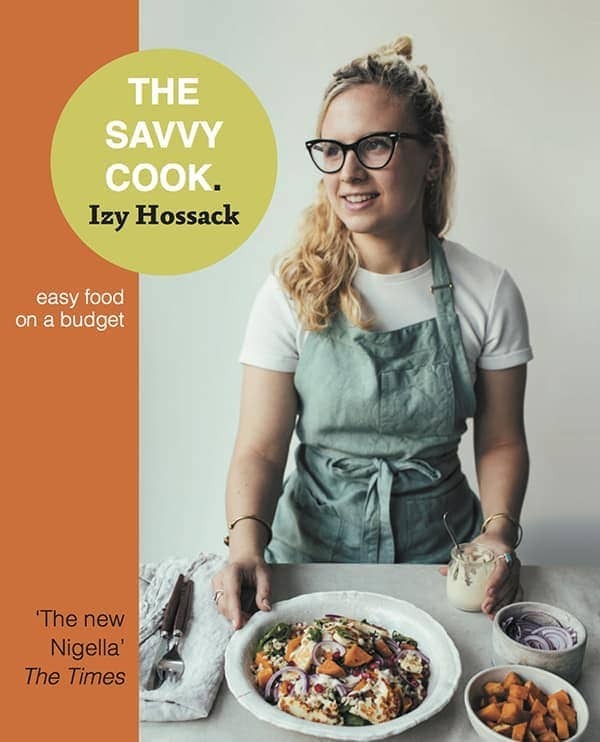 I’m always looking for quick meals to cook up – either for an afternoon when I have enough time to pop back from uni to have lunch or on a busy evening. 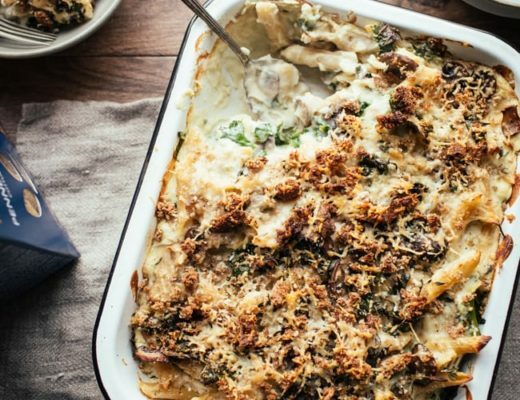 This is a 15-minute meal you can throw together so easily it’s almost unbelievable! That crispy sage really takes it to the next level imo. I made the recipe as I’ve been working with Cyber Aware to bring attention to the importance of updating your software and apps. 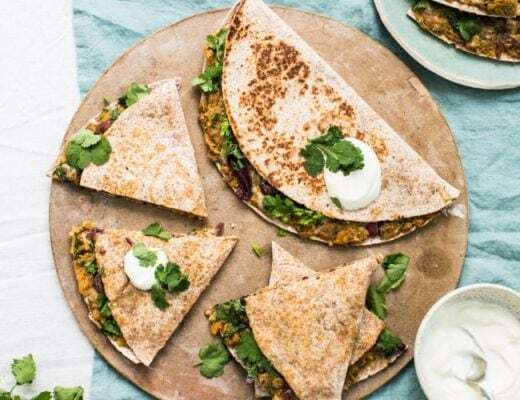 I know how annoying it can be to not be able to use your phone or laptop but if you resist that urge to press the ‘update later’ button you can spend that tech-free 15 minutes making this recipe as your tech updates! Below, I’ve got the recipe written out or a video embedded so you can follow whichever you want. Bring a large pot of water to the boil. Add the potato gnocchi and cook for 2-3 minutes. Drain the gnocchi and leave them in the colander. Return the pot to the heat. With the pot on a medium-high heat, add the olive oil. Once hot, add the sage leaves and cook until dark and crisp (about 1 minute) then remove with metal tongs to a plate lined with paper towel. Add the sliced mushrooms to the hot oil and cook for 3 minutes. Add the crushed garlic and continue to cook until shrunken and dark brown. Remove from the heat. 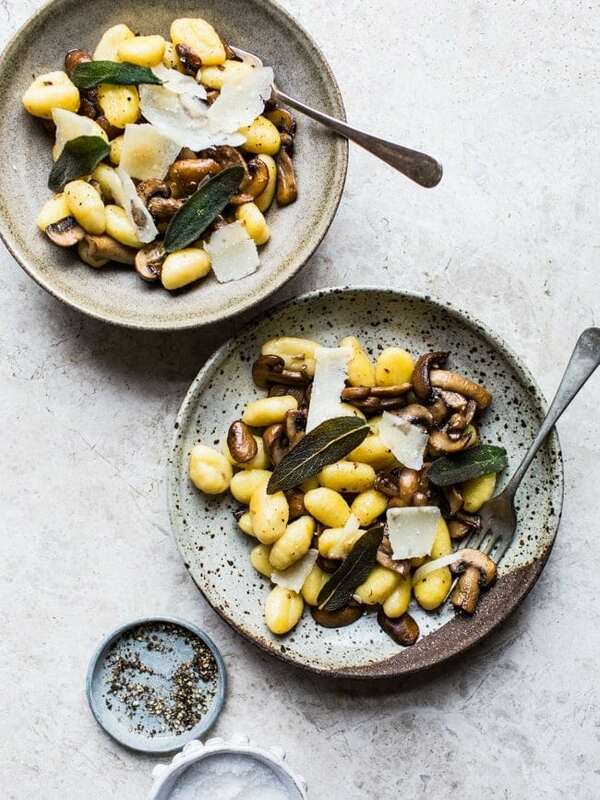 Place a frying pan over a high heat and add the cooked mushrooms to it along with the cooked gnocchi and the unsalted butter. Fry until the butter has melted and the gnocchi have warmed through. Divide between 2 bowls and then top with the crispy sage leaves, parmesan shavings, and some salt & pepper. Serve hot. PS: clever ad. I like the spin! 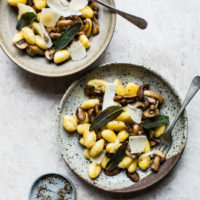 love gnocchi, one pasta I won’t shy away from while generally avoiding pasta, lovely recipe, simple ingredients like these are my favorites, since nothing is “masked”, so thank you for this recipe!